Small, local businesses trade only locally, national chain businesses trade from all over the country and multi-national businesses operate in other countries and major cities around the world. Local businesses have the ability to adapt to market changes quickly and continue to serve customers the same way they always have whereas a national chain will create policy, and the customer may have no resource to get what they need. Customers are most drawn to a business with the ability to give personal customer service with a positive attitude and with similar values. National chains may advertise good customer service, but may not have the ability to make sure the thousands of employees are actually giving the best customer service. 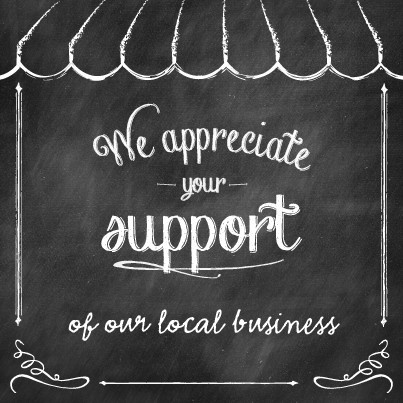 Small business owners usually live locally, making it easier to support or sponsor local causes connected to community events and fundraisers. Locals are more likely to support these small businesses, in return, becoming loyal customers. National chains may not be able to do this quickly and effectively. Promotional products, which can feature a company’s name, logo or other information, can also be more personal when they are offered by a local business, because a large chain will need to make them more generic to appeal to people throughout the country. Small businesses also have more of an advantage when it comes to using social media, including Facebook, Twitter, Pinterest and YouTube, to create local engagements with its customers. Posts and updates can relate to local celebrations sporting events and other activities. In general, large chains don’t use social media to their advantage. Bigger businesses do still use social media, but don’t always have the same ability to be as productive about answering individual comments and concerns posted on the page. When making your purchases at a small, local business it pays off in a far greater way than spending your money at a chain. You’re helping to make it possible for employees-your neighbors-to live and work without relying on government programs paid for by you, by supporting small businesses. Local businesses rely less on taxpayer money than large corporations. Local businesses in town centers require comparatively little infrastructure investment and make more efficient use of public services. A study shows that big chains like Wal-Mart and Target force large numbers of their employees to rely on government for health insurance, while small business that provide health insurance, do so at a significantly high cost-as much as $24, 000 a year for a small bike shop in Colorado with 4 employees. These big chains are gaining an unfair financial advantage over smaller and more responsible businesses by leaning on taxpayers. It has been reported that Democratic staffers in the House, roughly estimate, on average, that Wal-Mart employees require about $3,000 a year in public assistance. That works out to be roughly $900,000 per supercenter, equaling more than $4 billion annually in public costs nationwide. Shopping locally does not necessarily mean purchasing from a neighborhood store. It’s a way of supporting a community and lowering costs and environmental impact of purchasing an item from across the country or the globe, helping to reduce gas emissions and environmental damage. Since local businesses tend to purchase from other local businesses, supporting them helps minimize the environmental impact of transporting out-of-town goods. Independent local businesses employ a wide array of supporting services including architects, designers, cabinet shops, sign makers and contractors. Opportunities grow for local accountants, insurance brokers, computer consultants, attorneys, advertising agencies and others to help run it. Local retailers and distributors also carry a higher percentage of locally-made goods than the chains, creating more jobs for local producers. It is also mutually beneficial to both the consumer and the businesses because it is a way for customers to be more aware of the product they are buying and for owners to personally know more about their customers. Local businesses cater to their local communities and have the ability to focus on the needs of their consumers and tailor their services accordingly, and because they hire local people, their employees have a better sense of the community and have more of a personal connection with customers. Big chains often have to answer to large stockholders or corporate partners, giving them less flexibility in how they operate and the type of service they offer. Small businesses provide 75% of new U.S. jobs and are the backbone of our economy. 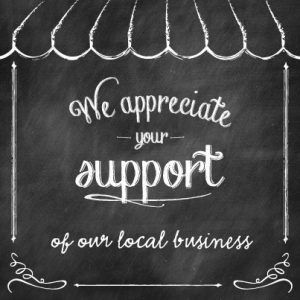 Supporting small, independent businesses helps keep your community unique and encourages people to visit. 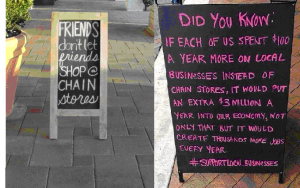 If every family in the U.S. spent an extra $10 a month at a locally owned, independent business instead of a national chain, over $9.3 billion would be directly returned to our economy. Several studies show that when you buy from an independent business, significantly more of your money is used to make purchases from other local businesses, helping to support the local economy as a whole. Studies also show that if residents of an average American city were to shift 10% of their spending to local businesses from chains, it would bring an additional $235 million per year to the community’s economy. Because local businesses are generally owned by people in the community, they are less likely to leave and are more invested in the future prosperity of the community. Community-based businesses are essential to charitable endeavors, frequently serving on local boards, and supporting a variety of causes. Approximately 64.8% of revenue is reinvested into the community and only about 33.6% of the revenue from national chains is reinvested into the community throughout the United States. Local businesses also make more charitable donations within the community than large businesses do. Non-profit organizations receive an average of about 250% more support from smaller businesses. Small, Local businesses are the largest employer nationally and provide the highest number of new jobs. When small businesses thrive, they can hire more people within the community. The introduction of national chains to a community often brings loss of employment. Studies have shown that the opening of a Wal-Mart reduces retail employment by an average of 150 jobs in the county of its location.